Ahhhh, recruitment advertising. Most of it is cheesy, done on the cheap and in a rush. All too often it ends up clichéd, unimaginative and dull. 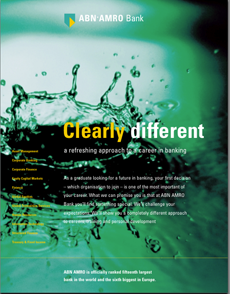 However, the ABN AMRO bank assignment was a little different. They wanted a quality product – one that would help them to attract the brightest and best young graduates to join their organisation. The main requirement was a 28-page brochure that would provide insight and detailed information about careers with the Dutch bank. In addition, I was also asked to write a series of adverts to help attract graduates to meet ABN AMRO recruiters at the annual university milk round. The results were effective at attracting the right kind of applicants, while also strengthening the bank’s branding. I tend not to write run-of-the-mill recruitment advertising these days. 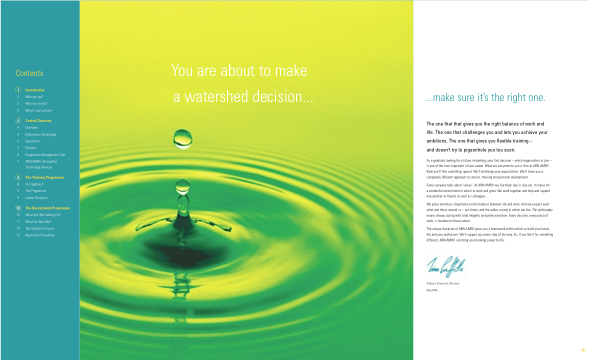 But if you’re looking for high quality recruitment literature, then please get in touch.